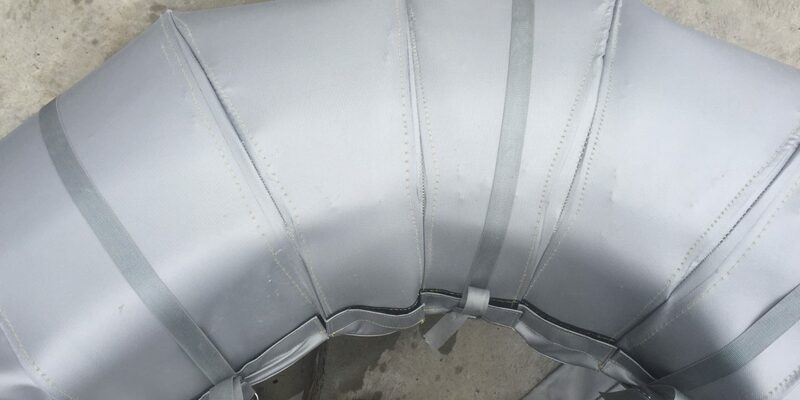 Perfect if you need highly effective outdoor pipe covers, Thermaxx antifreeze pipe insulation jackets help facilities avoid burst pipes and other cold-related problems. Freezing is a significant issue that can affect plastic, metal, indoor, and exterior pipes. It is one problem when flow stops due to freezing: outages are costly and unfreezing pipes can be costly in time and labor. An even greater problem occurs when pipes are weakened due to expansion from frozen water and the stress causes pipes to burst. Each year in the U.S., hundreds of thousands of buildings suffer damage from frozen pipes that cost hundreds of millions of dollars. Clearly freeze prevention is critical, and it is wise to examine various options according to circumstances. Water freezes when heat in the water is transferred to subfreezing air. One method of mitigating freeze risk is to eliminate that which can be frozen by completely draining pipes when not in use. Another method is to simply ensure air temperature is above freezing by turning up heat or allowing warm air access to at-risk areas. Naturally, these two methods are not always practical, financially viable, or even possible. A third means of reducing freeze risk is to leave water trickling slightly; however this does not fully eliminate risk and is not always practical or cost effective. The final means of eliminating freeze risk is to use insulation to slow or stop the transfer of heat out of pipes. While this method requires the greatest up-front investment, it is often the most-cost effective in the long run. 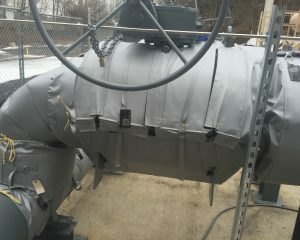 Insulation solutions range from simple inexpensive pipe covers to specialized anti-freeze pipe insulation jackets. The latter especially warrants consideration when the potential costs and risks of freezing are high, such as exterior piping for large facilities. Tight-fitting made-for-outdoors insulation jackets are the most effective insulation solution for keeping pipe temperature at a controlled range. Heat trace may be employed for extreme temperatures and for even more control. 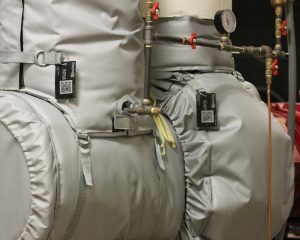 Thermaxx Jackets are often used to insulate outdoor water pipes and water lines, exterior steam lines, exterior condensate lines, and more. We can also make custom pipe jackets for many specialized applications like controlling temperature for pipes that carry temperature-sensitive chemicals and gasses. Heat trace ready: Our anti-freeze jackets can come with belt loops sewn on the inside of the jackets. 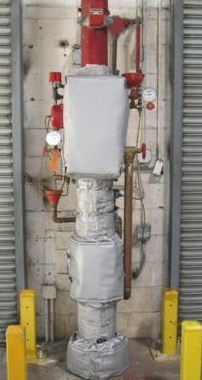 This makes all outdoor pipe jackets ready for installation of heat tracing if needed. Thermaxx does not supply heat trace but can recommend distributors in your area. Some users don’t require belt loops but ask that the jacket fit snug over the component and heat trace. The right fit: Closures (which can be modified to specific customer needs) typically include Velcro and side buckles for a tight, secure closure. Jackets also typically include side flaps secured by tie cord to minimize rotation and shifting. We produce standard-sized pipe insulation covers for 2-inch through 24-inch NPS. 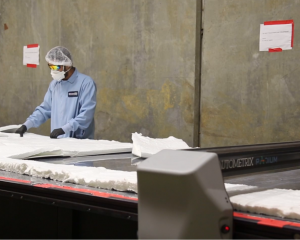 In addition, we also design insulation covers to exact specifications for custom jobs. Convenient: Our jackets are designed to be able to be removed and replaced easily and quickly by any personnel to facilitate easy pipe maintenance. In addition, when heat tracing is installed, the heat tracing comes off conveniently when the jacket is removed. Cost effective: We’ll provide you with pipe covers that work best for your climate and needs. Size, shape, thickness, and more are all tailored to your needs. Being able to buy exactly the jacket you need means you don’t have to pay for un-needed insulation. High quality: Our outdoor pipe jackets are meticulously designed and crafted to remain effective under harsh conditions for extended periods of time. As with all Thermaxx Jackets, we put our money where our mouth is and stand behind our anti-freeze pipe insulation jackets with a 5 year guarantee. Got questions? 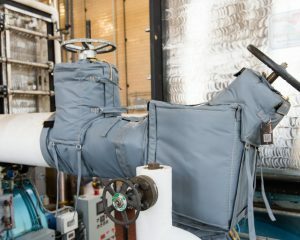 We’re happy to answer any questions you have about our anti-freeze pipe insulation covers or any of our many other removable insulation solutions for your facility.